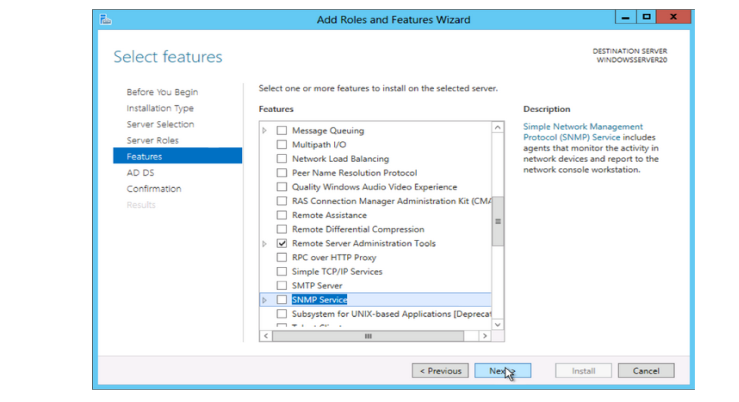 Note: Roles are the major feature sets of the server, such as IIS, and features provide additional functionality for a given role. 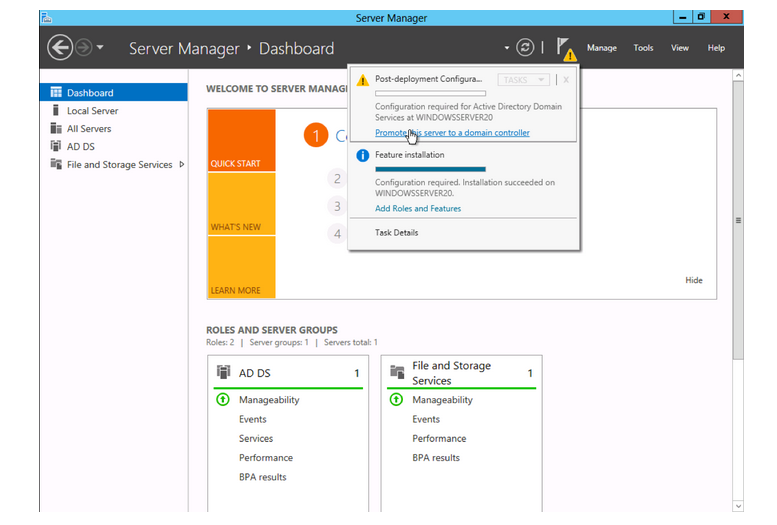 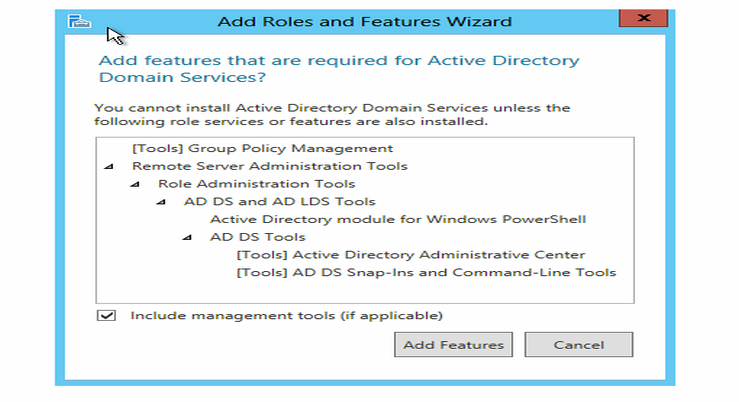 From the Server Roles page place a check mark in the box next to Active Directory Domain Services. 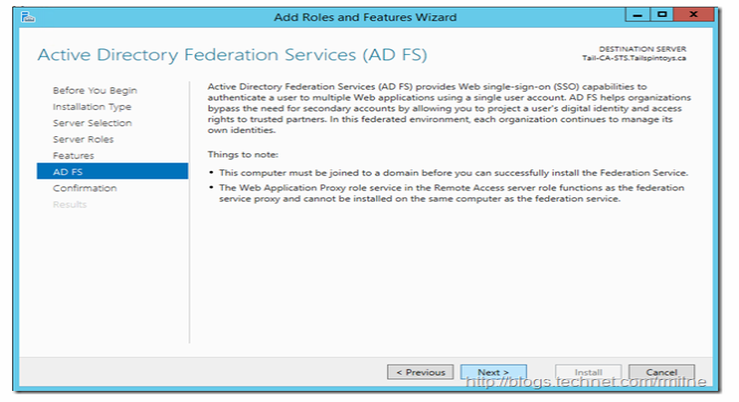 A notice will appear explaining additional roles services or features are also required to install domain services, click Add Features. 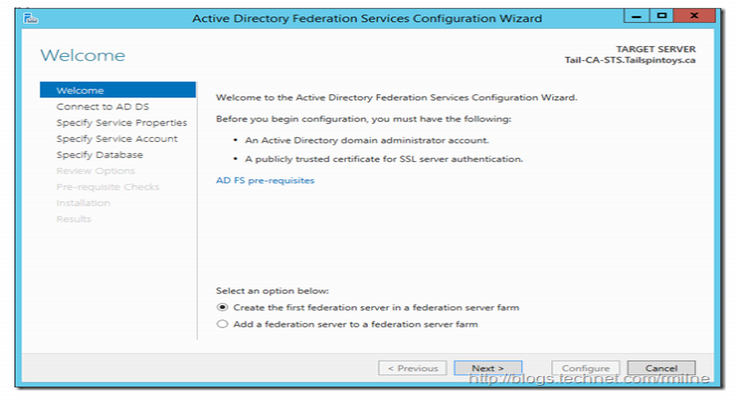 Note: There are other options including, Certificate services, federation services, lightweight directory services and rights management. 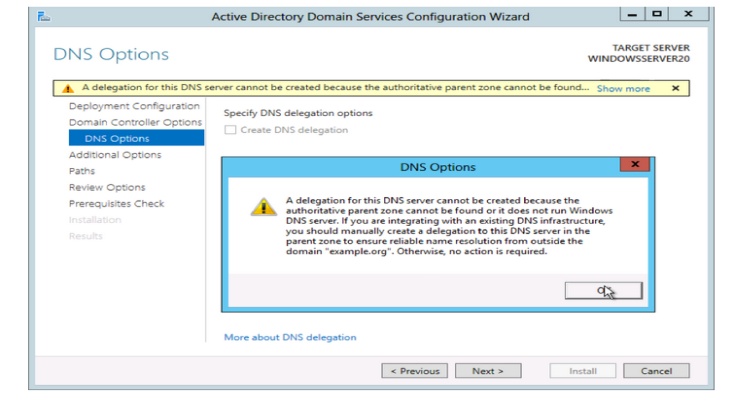 Domain Services is the glue that holds this all together and needs to be installed prior to these other services. 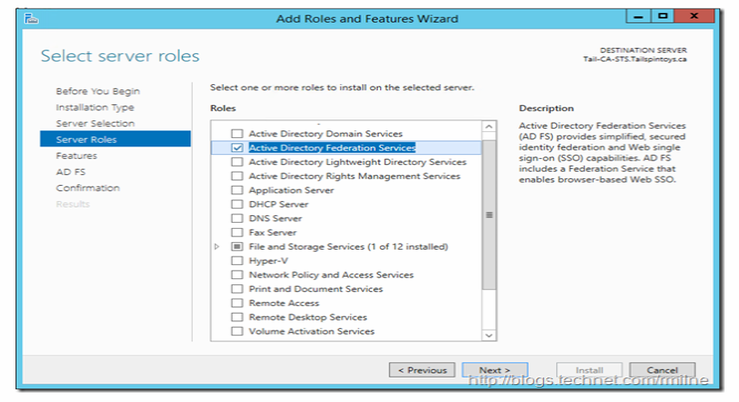 Review and select optional features to install during the AD DS installation by placing a check in the box next to any desired features; Once done click Next. 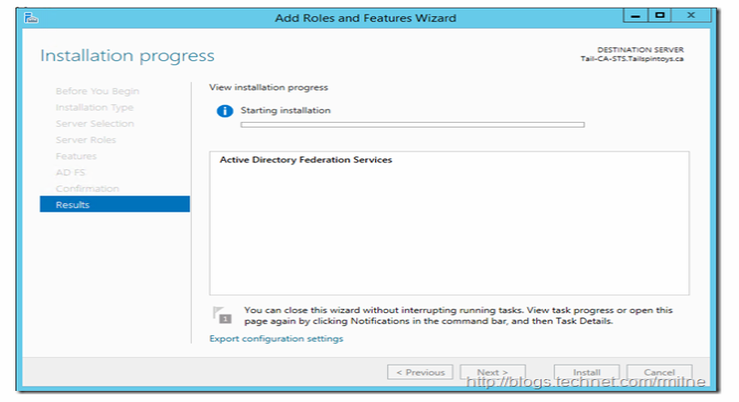 Review the installation and click Install. 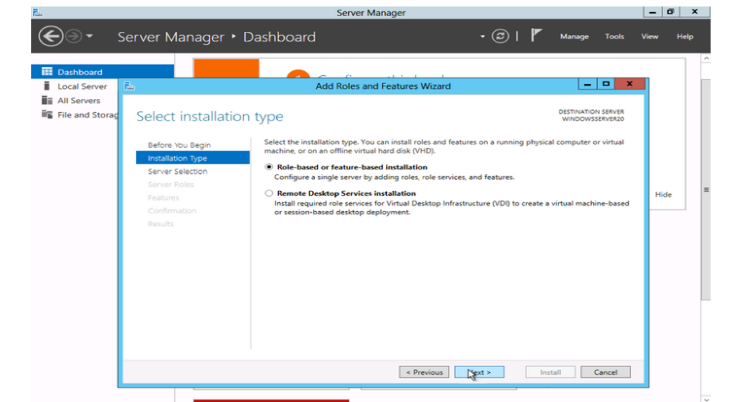 Note: The installation progress will be displayed on the screen. 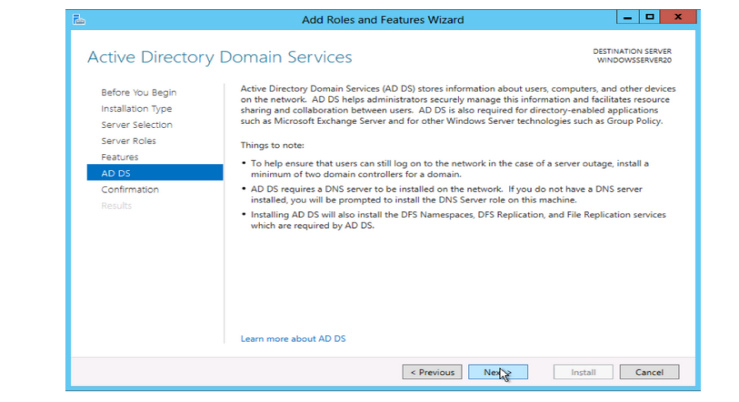 Once installed the AD DS role will be displayed on the 'Server Manager' landing page. 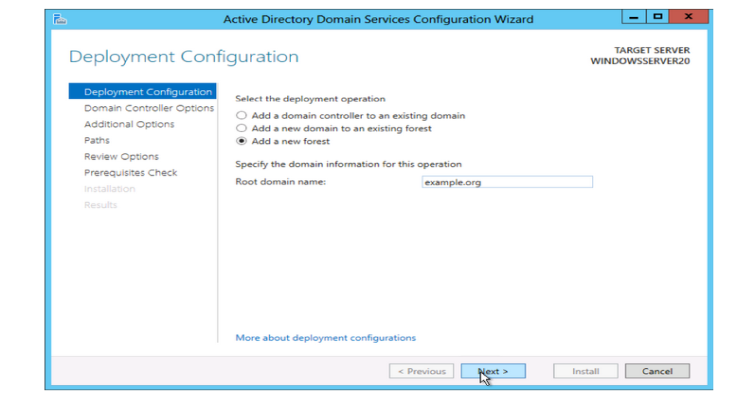 From the Deployment Configuration tab select Add a new forest from the radial options menu. 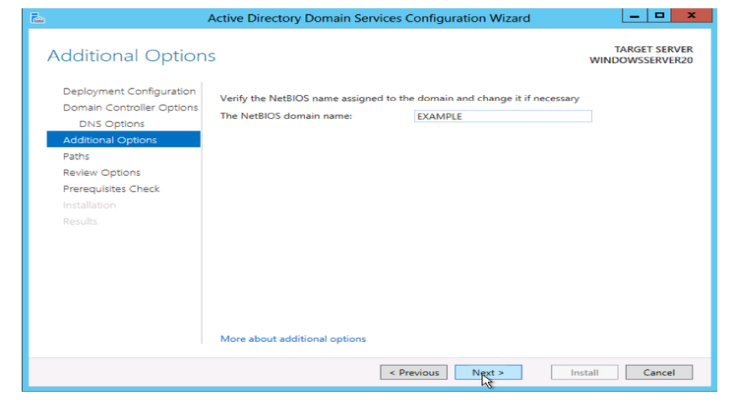 Insert your root domain name into the Root domain name field. 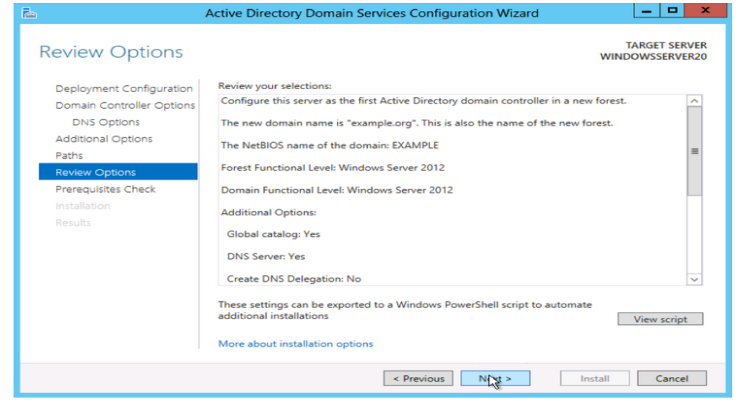 Review and select a Domain and Forest functional level. 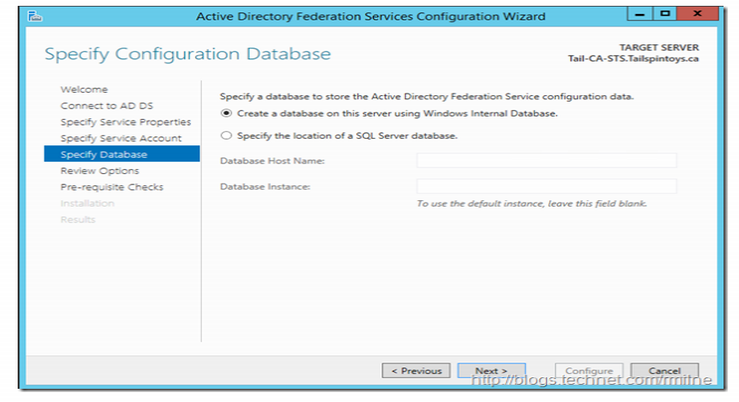 Once selected fill in a DSRM password in the provided password fields. 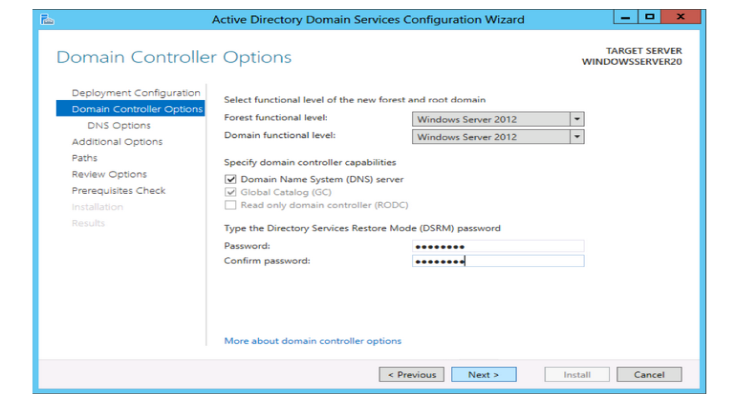 The DSRM password is used when booting the Domain Controller into recovery mode. 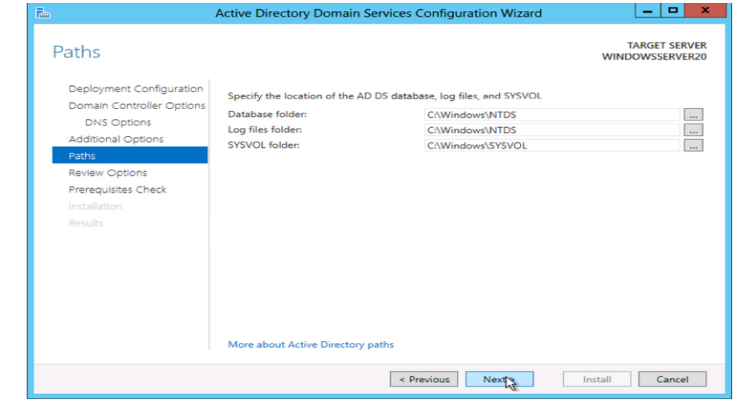 Configure the location of the SYSVOL, Log files, and Database folders and click Next. 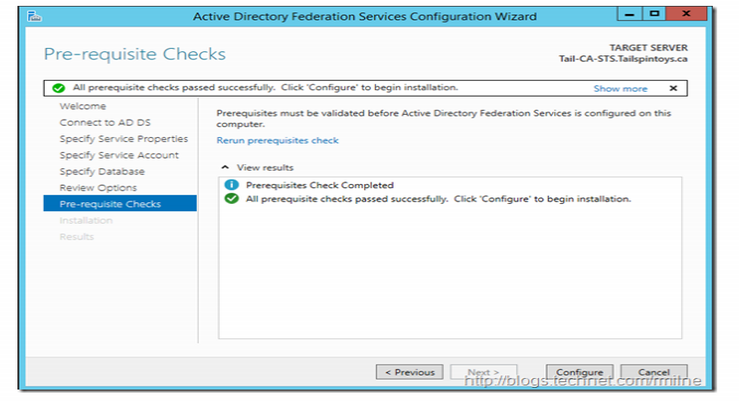 The system will check to ensure all necessary prerequistes are installed on the system prior to moving forward. 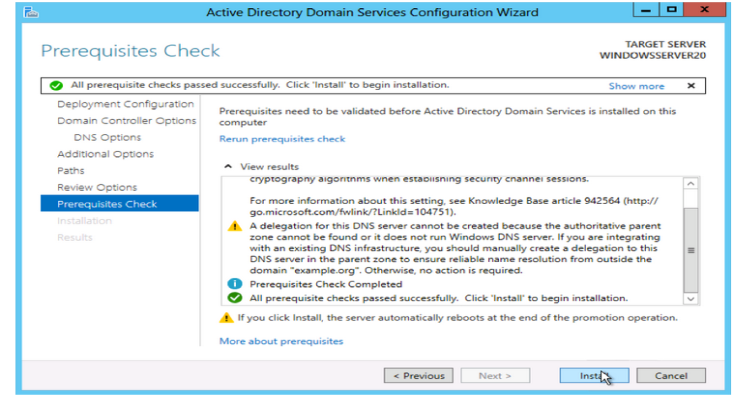 If the system passes these checks you will proceed by clicking Install. 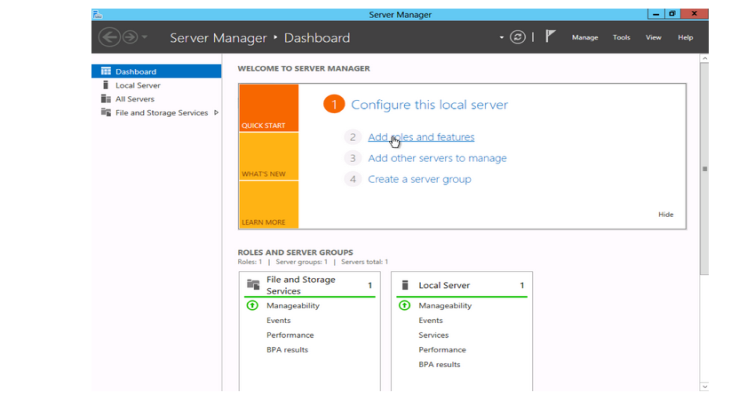 Note: The server will automatically be rebooted once the installation completes. 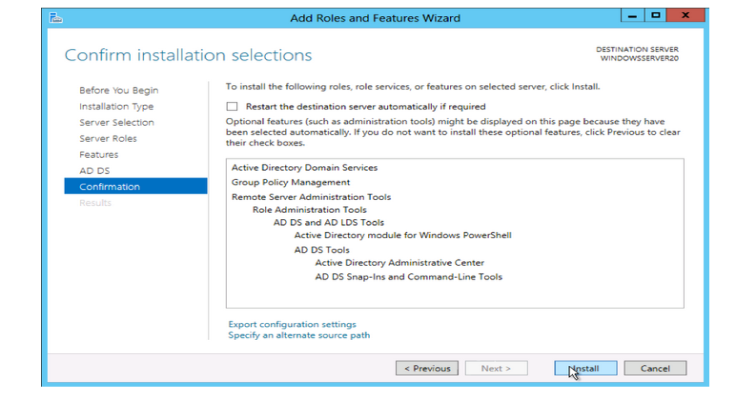 Once reboot is complete, the Active Directory is setup and configured. 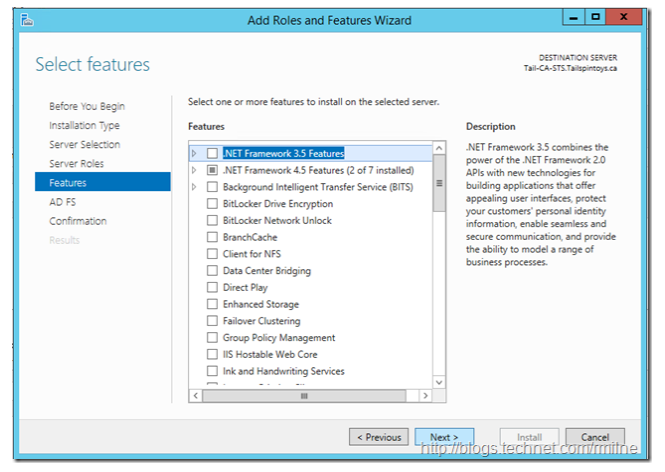 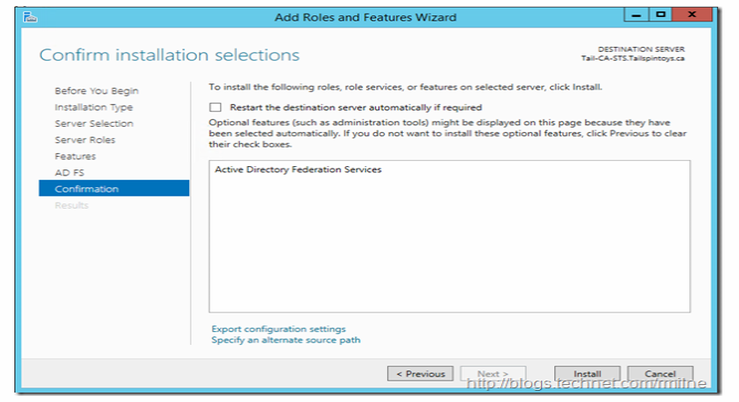 After starting up server manager, Add Roles and Features wizard, select Active Directory Federation Services, then click Next. 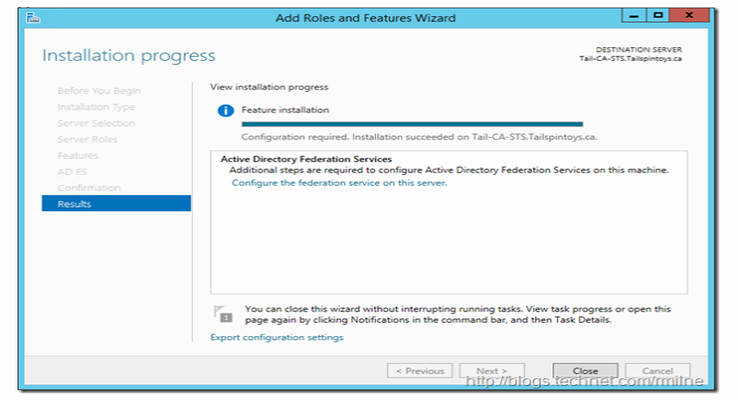 Clicking next will then install the necessary bits. 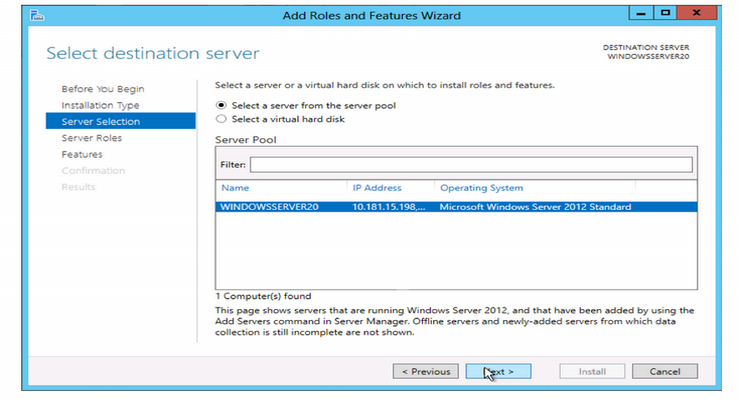 Installation is complete. 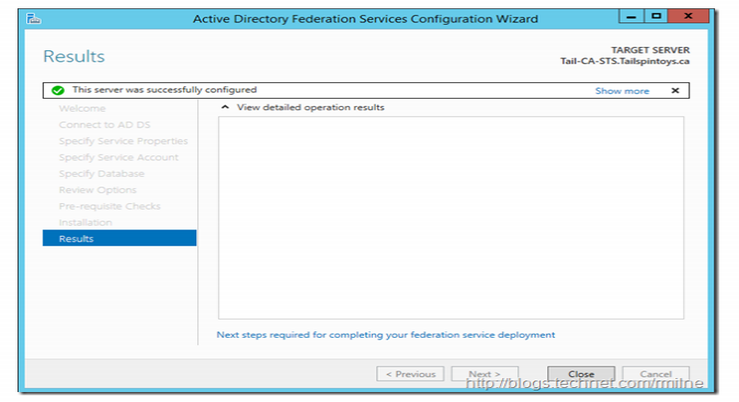 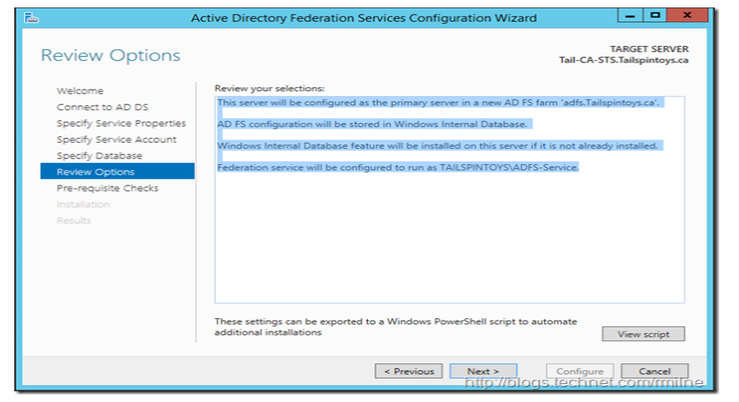 You can launch the ADFS configuration wizard from here, or alternatively if this window is closed it can be launched from server manager. 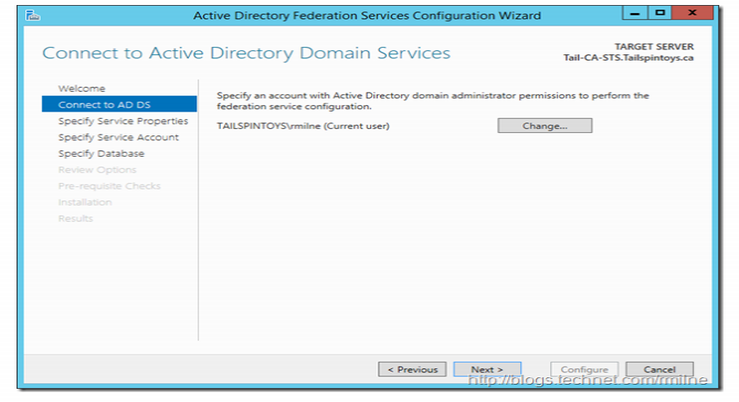 Provide your Active Directory Domain admin credentials.